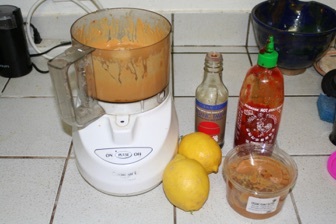 The Sauce: 1/2 cup peanut butter, 1/4 cup lemon juice, a good squirt of chili sauce, 1/4 cup soy sauce or tamari. Blend all in food processor & adjust to taste. Our Mid-Pride Peach in bloom. This tree is a low-chill, desert adapted variety (and delicious!). Jeff and Farraday both ran the Phoenix Half Marathon in March. This was the first half marathon for both of us and we’ve been training for it for months. There were 4,500 registered runners. 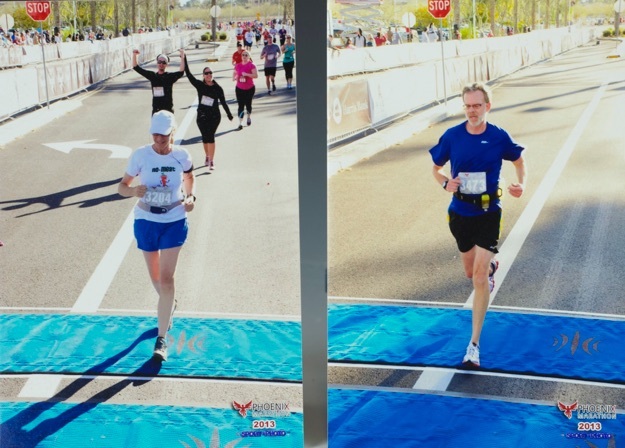 Photo below: The both of us crossing the finish line, with Jeff way, way before Farraday! Jeff’s run was awesome (Farraday writing this! ), coming in 5th in his age class of 50-55. Jeff also finished under his goal time of 1:40 with a chip time of 1:39! Farraday met her goal too, which was simply to finish, which she did at a respectable 50% ranking in her age class of 55-60. 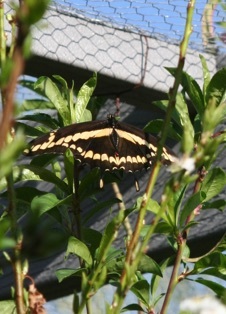 Photo above: We’ve companion-planted onions under many of our fruit trees that grow inside our garden cage. Rather than heavy mulching like the fruit trees outside the cage (as written about earlier in this newsletter), we let the substantial leaf litter and understory plantings suffice. Under these plum and pluot trees( a pluot is a plum-apricot hybrid) we planted I’itoi, a bunching onion (actually a shallot) that was introduced to Arizona by the early Spanish. These tasty, prolific multipliers are very hardy in our desert conditions. 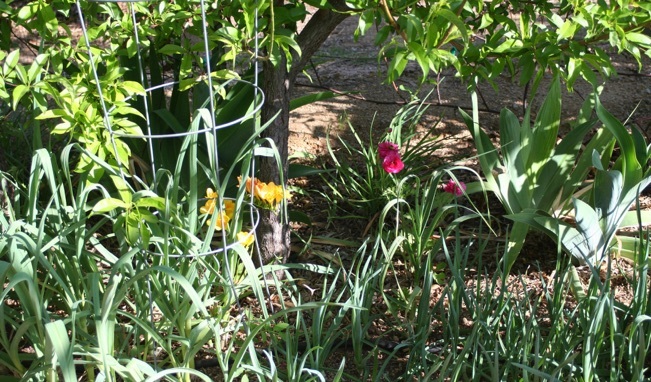 The idea with this companion-planting is that the strong smell of onion helps deter insect pests from the fruit trees. 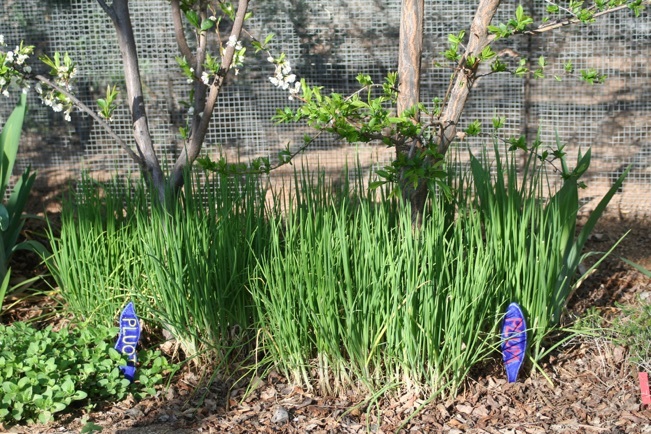 Photo below: Under our two peach trees we have garlic growing (the grass-like greenery in the foreground), companion-planted to discourage and confuse insect pests. Amidst the garlic we’ve planted a few flowering perennial bulbs, including freesia (yellow flowers), ranunculus (hot pink flowers), and irises (not blooming yet). Photos below, left to right: Red-stemmed Swiss Chard; a native giant swallowtail butterfly (Papilio cresphontes) flew into our enclosed garden, which Jeff heroically rescued and released; winter radicchio (Red Cerviso, an Italian heirloom) ready to harvest. 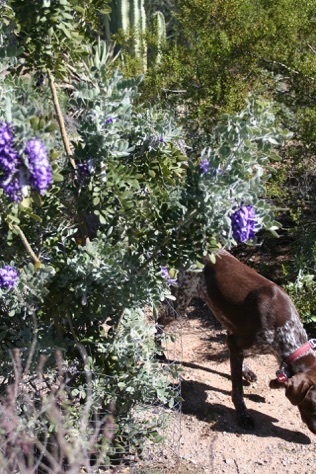 A good part of the backyard is sweetly perfumed this time of year with the delicious grape soda scent of purple-flowering Texas Mountain Laurel ‘Silver Peso’ (Sophora secundiflora). 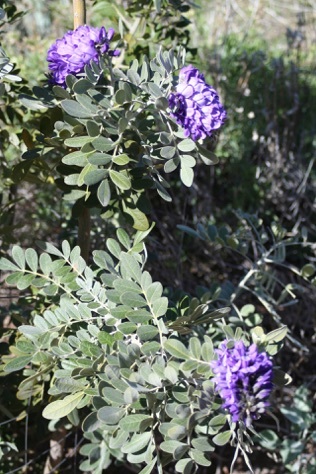 This beautiful tree is native to south-central and western Texas. Skye made her way into the photo too! 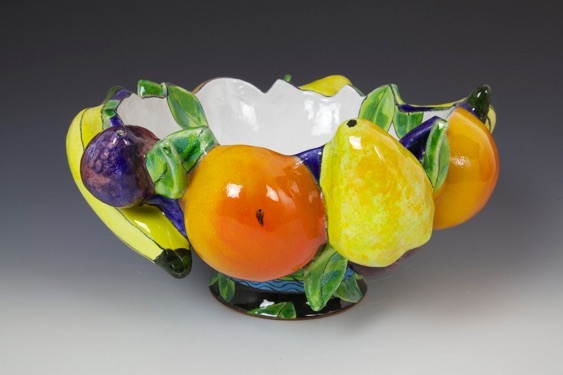 For studio artists in the low Sonoran Desert, high season is fall through spring. 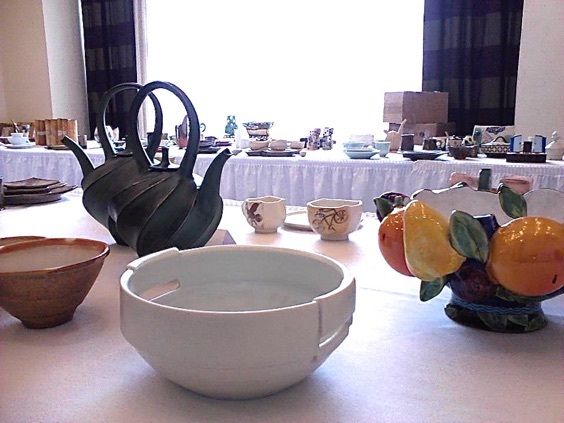 Museum and gallery openings, galas, and studio deadlines lessen by April. Many of our winter visitors have already returned to cooler climates. The desert is beginning it’s inevitable, inexorable warming trend. Although the upcoming hot season is merciless, we look forward to this quieter time of year. Show and event deadlines are behind us for the time being. There are a few transitional weeks of spring to summer now that give us precious, unhurried time to be outside before it is truly hot. 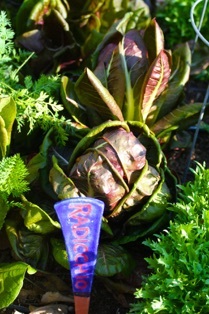 This newsletter is therefore heavy on the gardening, reflecting our happiness to be outdoors! 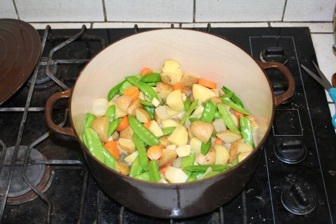 The Stew: microwave (or steam) cut up carrots, parsnips, snow peas, onions, and Yukon Gold potatoes in a little water until tender. Put them all in a large pot on the stove, including the cooking water. 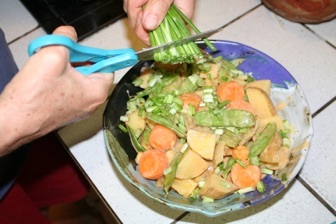 Slide stew into serving bowl and chop in fresh scallions. 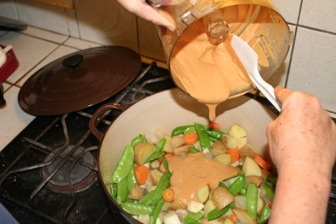 Stir sauce into vegetables and heat to just bubbling. 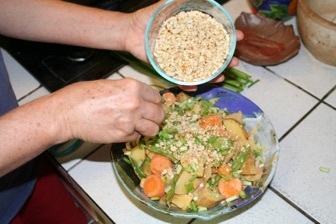 Sprinkle chopped cilantro and chopped peanuts on top. Dinner is ready! 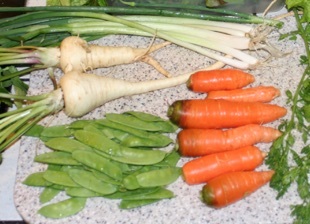 Garden haul of carrots, snow peas, turnips scallions and cilantro to use in this dinner. It’s been a couple of years since we did a big mulching, so we ordered a truckload of wood chips delivered (free!) from a local tree service. These are their ground-up tree trimmings, which are waste for them but gold for us. Giving us the load keeps it out of the landfill and saves the tree company a steep dumping fee. Win-win. It’s a big project for us to wheelbarrow the 4‘x10‘x20’ pile to the many fruit trees mixed in with our desert landscape outside the garden cage, so we’ve been happily busy. 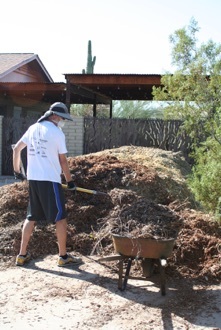 Mulching is so important here in the desert where water is scarce. It greatly conserves water use by reducing evaporation from the soil. Our drip irrigation lines are at soil level, under all the mulch. Mulching also keeps the soil temperature cooler and more even. The retained moisture and lower soil temperature encourages microbial and worm activity, which eventually compost the mulch and build soil. Lastly, mulch helps alot with weed suppression. We slathered a thick layer of our homemade compost under each tree and watered it in before piling on the mulch. That layer of compost will provide a boost of nitrogen for the tree as well as for the mulch decomposition process. 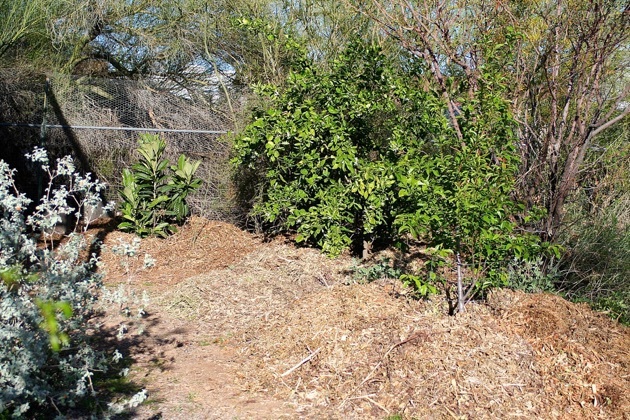 We were inspired to mulch this way a few years ago when we saw deep, volcano-style mulching on a row of pomegranate trees at the University of Arizona Maricopa County Extension gardens in Phoenix, and then again at the fabulous home orchard of Mesa resident Doug Jones. (To read our archived story on Doug’s yard, click here). Photos above and below: Jeff shoveling a wheelbarrow load of mulch. We pile the mulch in a volcano-shaped ring around each tree, being careful not to go against the trunk (which could rot the trunk and kill the tree). 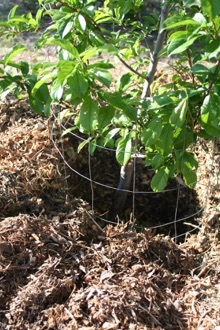 The wire cages that had originally been place to keep rabbits from gnawing the trunks of the young trees now work beautifully to keep the mulch clear of the trunks. 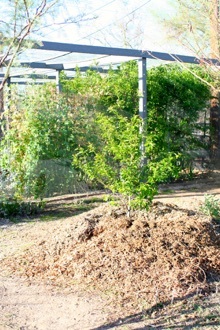 The photo below shows finished mulching of a young loquat (at rear with the large leaves), a tangelo, and an Inca plum. We love to cook from the garden. 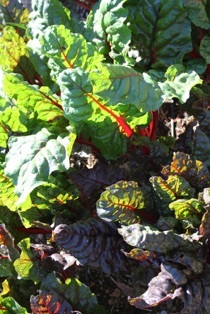 Here is an example of what we are picking and cooking during desert spring. This stew is an adaptation of vegan pad thai made with potatoes instead of noodles.